Cucumber pachadi without coconut or vellarikka pachadi recipe Kerala style without coconut (vellarikka is the malayalam word for cucumber and this dish is also known in malayalam as vellarika kichadi) is a very easy South Indian Kerala style vellarikka curry without coconut (Kerala cucumber curry without coconut) which is made of fresh cucumber and yogurt with few added spices. This is different from cucumber pulissery (vellarikka moru curry) though both recipes uses pretty much the same ingredients. While cucumber pulissery is a curry with gravy, the cucumber pachadi is mainly used as a side dish which is served in small quantities. Cucumber yogurt curry or pachadi is made using cucumber, yogurt (click here to buy yogurt maker from India) and very few spices as this is a very mild tasting curry which is very cool and refreshing. 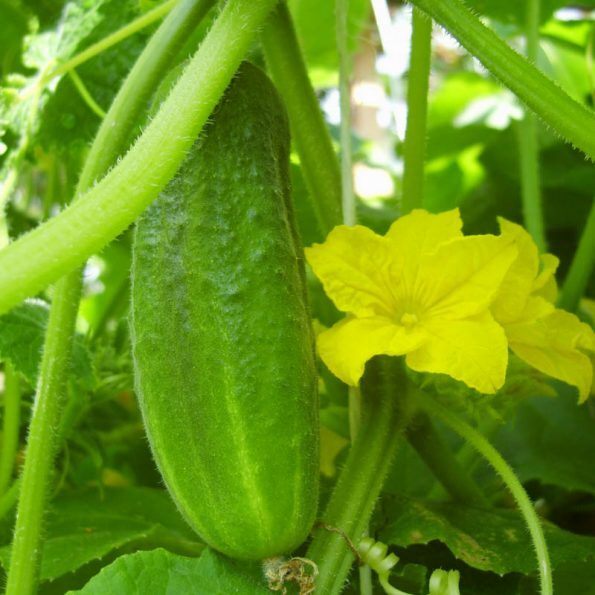 What Is Cucumber Pachadi (vellarikka pachadi) or Cucumber Kichadi? Vellarikka kichadi or vellarikka pachadi is the name for this recipe in Kerala ( South Indian state) where malayalam is the language used. It is important to note that the Indian khichdi (the north indian ric and dal dish) is really different from this Kerala dish which is also known by very similar name kichadi. Vellarikka pachadi is a traditional Kerala dish and it can be made with coconut yogurt blend for gravy or just a simple version of yogurt with spices (here we only uses yogurt and spices as this is an easy method). As I mentioned above, vellarikka means cucumber in malayalam. You will love this dish if you love Kerala vegetarian dishes and especially the combination of fresh cucumber and yogurt. The combination of cucumber and yogurt has a wonderful cooling effect since both the ingredients – cucumber and yogurt are known for their cooling effect on our bodies. Both cucumber and yogurt based salads and drinks are especially refreshing during the hot summer months. Raw Cucumber yogurt sandwich is also a popular tea time sandwich in many places. 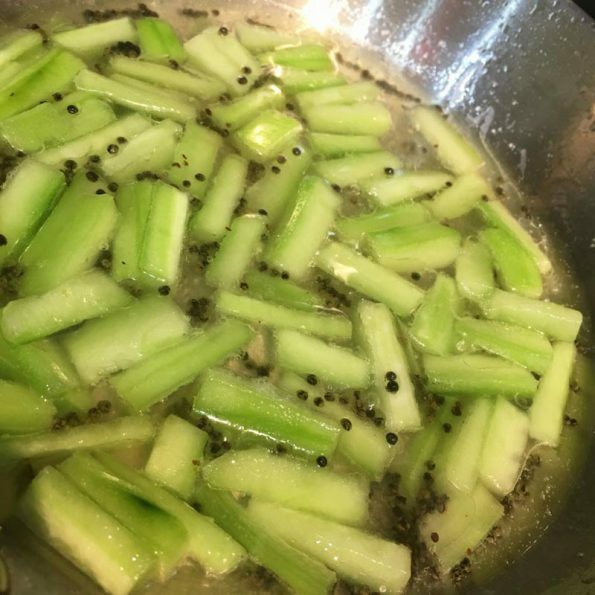 How To Make Cucumber Pachadi? 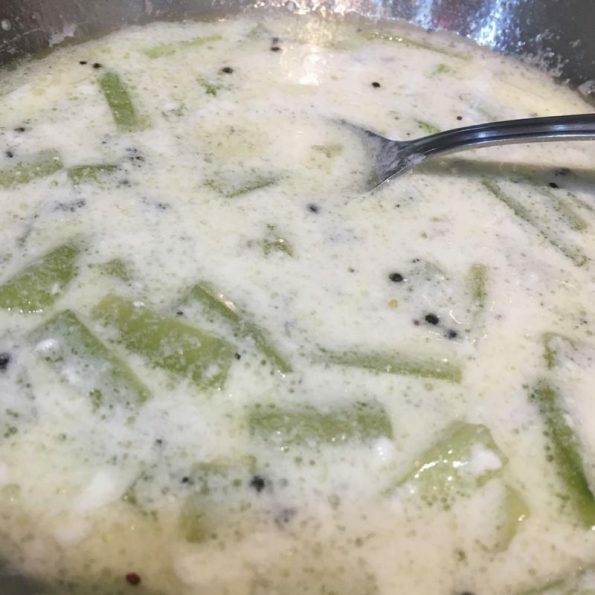 The cucumber yogurt dish known as vellarikka pachadi or kichadi recipe Kerala style can be made using blended coconut yogurt gravy with spices but this is an easy version of traditional Kerala style vellarikka pachadi where we only uses yogurt and spices and skip using coconut. However if you wish, you can easily make this cucumber recipe (vellarikka pachadi or kichadi recipe) without coconut just by adding fresh yogurt and few other ingredients. Sometimes we are just too busy we want to make it really quick, or sometimes we are just out of stock of coconut, but that doesn’t mean you cannot enjoy vellarikka kichadi or cucumber kichadi. You can easily prepare this cucumber or vellarikka kichadi in yogurt gravy without coconut and it is simple and tasty as well. You can enjoy few spoons of vellarikka kichadi with rice for lunch or dinner. So back to the vellarikka pachadi or kichadi (cucumber pachadi or kichadi), this Kerala style pachadi or kichadi recipes made with yogurt is cooling and they are refreshing when served with hot dishes and curries. In fact, the main purpose of serving few spoons of pachadi or kichadi for the Kerala feast or any South Indian lunch is to reduce the heat and spiciness from other curries or side dishes. That is why they are usually just served in small quantities, as it is meant for cooling you off! While fresh raw cucumber is enjoyed with yogurt salads popularly known as raitha in India, this cucumber yogurt recipes calls for cooked cucumber in it along with a very simple seasoning. It is a very light dish, nothing fancy in it, you can enjoy it with rice. Usually there will be other side dishes for rice and the cucumber yogurt dish is usually enjoyed as an extra dish by serving just one or two spoons of it along with rice and other dishes. Yes, this is an extra dish for the lunch or dinner menu, and it is generally not enjoyed as a main dish. This kind of Kerala style pachadi or kichadi recipes are almost always served for Kerala style feasts (as one of the dishes where it is served in very light quantities). This recipe makes multiple servings as one serving is only 1 to 2 tablespoons usually. 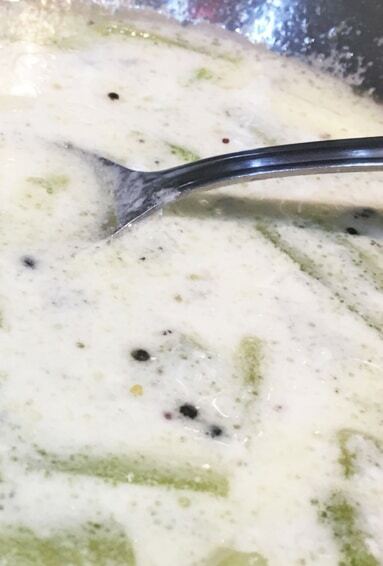 Cucumber pachadi or vellarikka pachadi recipe without coconut is a simple, easy and yummy South Indian style yogurt based cucumber dish (kind of cucumber raita with spices) which is often served with rice along with other side dishes and curries for lunch or dinner. The cucumber pachadi is very cooling and refreshing, so it is more enjoyed during the hot summer months though it is prepared all year round in the mostly hot weather in Kerala. Peel the skin of the cucumber and cut it open and remove the seeds. You can gently scrape off the seeds using a knife. Slice the cucumber in very thin and short slices. 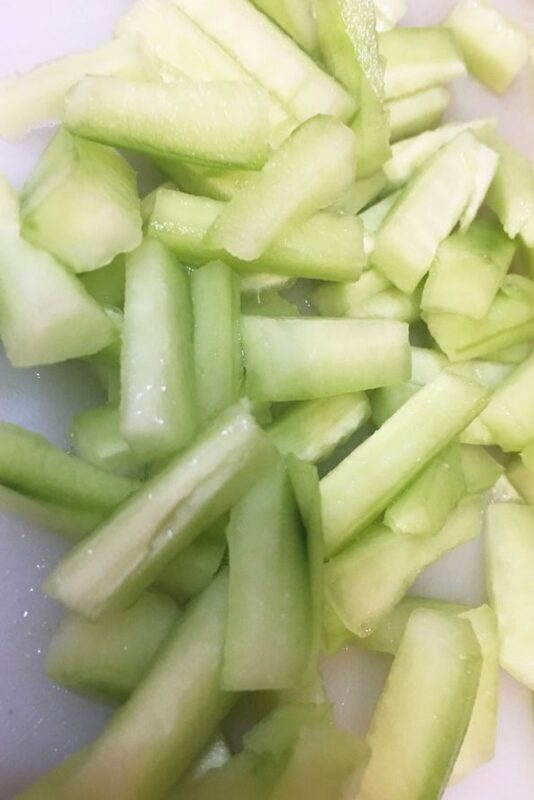 See the picture which shows the sliced cucumber for pachadi recipe. To prepare the seasoning, Heat oil in a pan and add mustard seeds. When the mustard seeds splutter, add curry leaves and red chilies fry for a few seconds. To prepare the dish, Add the cucumber along with water, add salt and wait for the water to boil. When the water starts boiling, reduce the flames, cover the pan and cook for about 6 to 7 minutes. After the cumber is cooked, you can switch off the stove and keep it for cooling. Once it is cool enough, add the yogurt and mix everything well. Enjoy with rice for luch or dinner or Kerala sadya (feast). 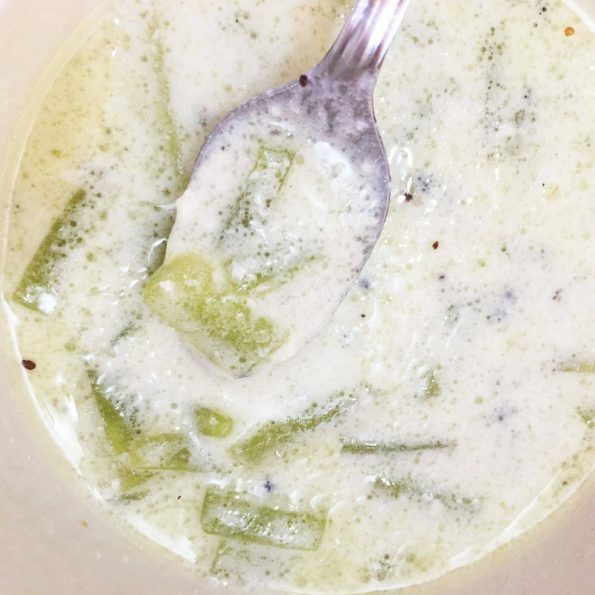 Cucumber pachadi without coconut tastes best as it cool off and thickens by its own. Hope you found this post on cucumber pachadi without coconut or vellarikka kichadi or vellarikka pachadi recipe (cucumber yogurt curry without coconut) helpful in making easy and yummy cucumber yogurt curry for lunch or dinner.